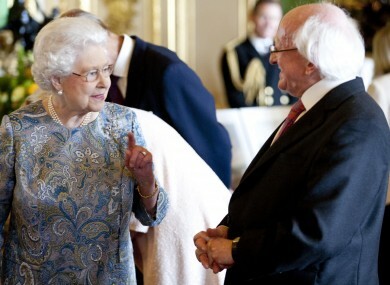 President Michael D Higgins with Queen Elizabeth II during the President's State Visit to the United Kingdom. THE GOVERNMENT HAS mooted the possibility of inviting a member of the British royal family to attend 1916 commemorations in two years time – and now it seems that the public would support this. An Irish Times/Ipsos MRBI poll has placed support for the plan at 69 per cent, with 21 per cent against while 10 per cent had no opinion. The poll also reveals that support is polarised between generations, with those aged 18 to 24 least in favour of the visit, while over 65s would most like to see a member attend the celebrations. A majority of Sinn Féin supporters would like to see the government follow through with its plan, with 55 per cent for and 38 per cent against. Labour and Fianna Fáil supporters both polled at 69 per cent in favour, with Fine Gael out in front at 78 per cent. A similar, although not scientific, poll on TheJournal.ie held over the Easter weekend revealed a split in public opinion. From just over 9,000 votes, 49 per cent was against the Royal Family attending the commemorations of the Easter Rising, with 41 per cent in favour and 9 per cent remaining unsure. Email “Irish people want to see the royal family visit for 1916 commemorations”. Feedback on “Irish people want to see the royal family visit for 1916 commemorations”.